The Bricklieve mountains viewed from Queen Maeve's cairn on Knocknarea. Carrowkeel is to the left and Kesh Corran to the right. Introduction to R. A. S. Macalister's 1911 report on his excavations at Carrowkeel. Immediately to the north of the anticline forming the Curlew Mountains, which rise on the border of the counties of Roscommon and Sligo, stands the hill of Carrowkeel (Ceathramhadh Caol, "the narrow quarter "). It looks down on Lough Arrow, which lies at the western base, while the well-known hill of Keshcorran (1185 feet) rises a couple of miles to the north-west (O.S. one-inch map, sheet 66; six-inch Sligo sheet 40). Carrowkeel is an extensive flat-topped hill, with a maximum elevation of 1029 feet. The area above 500 feet is approximately circular in plan, and 2 miles in diameter. Inside this area the ground generally rises steeply to a height of 700 to 1000 feet, and the flat heather-clad summit which ensues slopes gently from north to south. The hill is formed, like its neighbour, Keshcorran, of the Upper Limestone of the Carboniferous formation, resting almost orizontally, and the slight south ward slope represents the dip of the beds. The continuity of the flat top of the hill is broken by a series of remarkable cliff-walled rifts which cut across it from N.N.W. to S.S.E. These rifts are about 100 to 300 yards across, and 100 to 200 feet in depth, and they produce a singular and picturesque effect (Plate XI, figs. 1, 2). They appear to be the result of weathering along a series of strong vertical joints; and the presence of the same series of joints in the surrounding country may be seen in the parallel ridges and hollows of the country to the northward, and the consequent direction of streams and roads; and also in the prevailing directions of the shores of the island-studded Lough Arrow. The country surrounding Carrowkeel is generally fertile, and no doubt supported a large population since early times. These people have left abundant monuments of their occupation, and carns are unusually numerous in the district, ranging in size from the gigantic monument which crowns the summit of Knocknarea, 16 miles to the north-west of Carrowkeel, to small mounds a few yards in diameter. 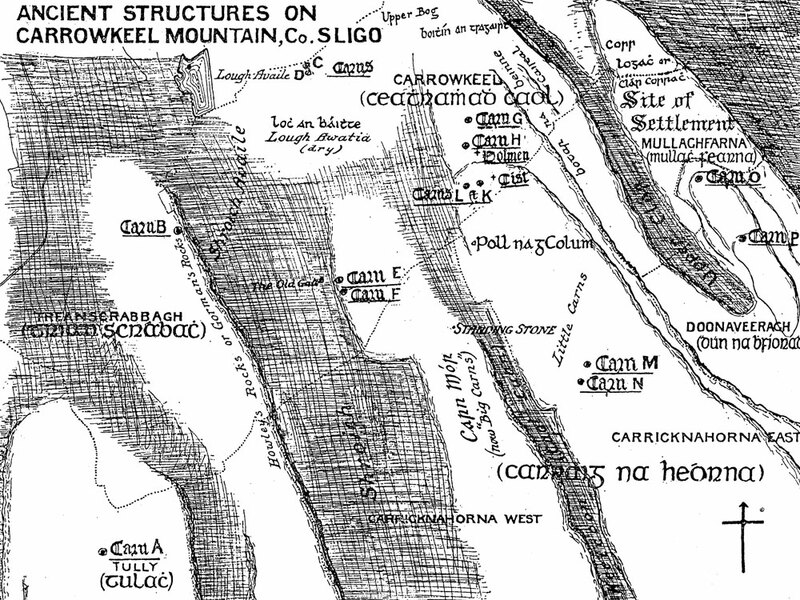 Macalister's map of the ridges and principal cairns at Carrowkeel, 1911. The series of carns which rise among the heather on the summit of Carrowkeel, and with which the present report is concerned, have been referred to, but no more,	by previous writers. Rev. C. Cosgrave, P.P., alludes to them in the Proceedings of the Kilkenny Archaeological Society, vol. iii, p, 58 (1854-5), and Colonel Wood-Martin in Rude Stone Monuments of Ireland, p. 207 (1888), makes a passing mention of them. The carns were examined by R. L. Praeger in 1896, while he was engaged on botanical survey work; and as several of them appeared to be intact, and as the group promised to repay well the labour of opening them, the present investigation has after some years been undertaken. While on the drift-covered lowlands such	cairns are frequently formed of clay, here on the hill-top they are formed entirely of local limestone, which is a splintery rock with much chert irregularly disposed. No doubt as originally built they were constructed of blocks such as a man could lift conveniently. But three to four thousand years exposure to heat and cold, rain and frost, have shattered the already splintery boulders, so that the carns are now mounds formed to a considerable extent of material like coarse road metal, with large blocks between, material difficult to excavate, being too coarse and interlocked for spade work, and too much broken up for convenient pitching by hand. Section 5 has been written by Prof. Alexander Macalister, of Cambridge, who accompanied the party on their first visit to the site, and Section 6 is the joint work of the three authors, whose several shares in the earlier sections are denoted in the above table by their initials. It should, however, be said that every detail has been discussed as thoroughly as possible, both on the spot and subsequently, and that the contribution of each author has been read and criticised by both his colleagues. All three collaborators, therefore, may accept joint responsibility for every statement and deduction made throughout the report. 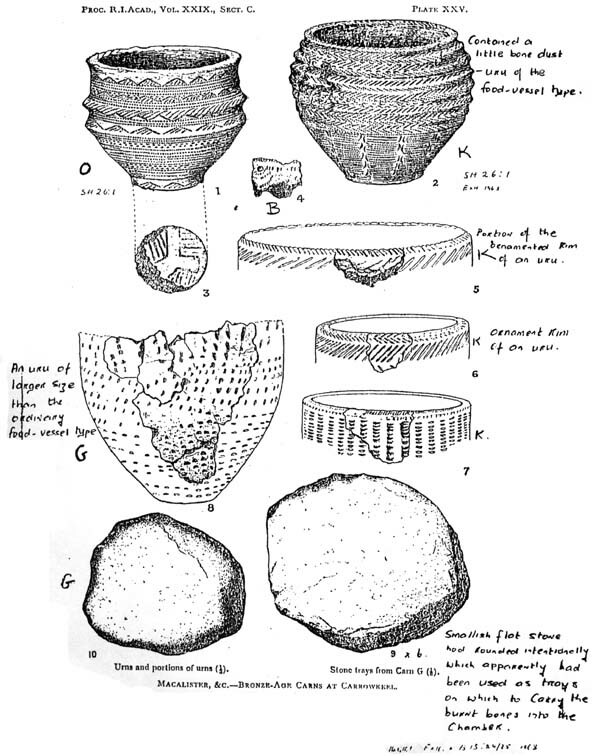 Some of the pottery found by Macalister and company in 1911. Relation of the Carns to the Peat. At present the greater part of the flat summit of Carrowkeel is densely heather-clad, the heather growing on a layer of peat several feet in thickness. Bog much deeper than this is met with in many places on the hill, especially in the rifts, but not in the proximity of the carns on the cliff-walled ridges. There the rock shows through the peat only occasionally, though sink-holes are numerous; one fine open cave-mouth, called Poll na gColum, lies close to one of the groups of carns. Around the edges of the carns, and also where the rock shows through, the peat shrinks back, so to speak, leaving a depression between the heather and the limestone; in other words, much, if not all, of the peat has grown since the carns were built. In some places, indeed, the peat has crept up the side of the carn (as on the north side of Carn G), or has completely overwhelmed it (as is the case with the ruined Carn L). But in any case the late age of the peat as compared with the carns is evident. 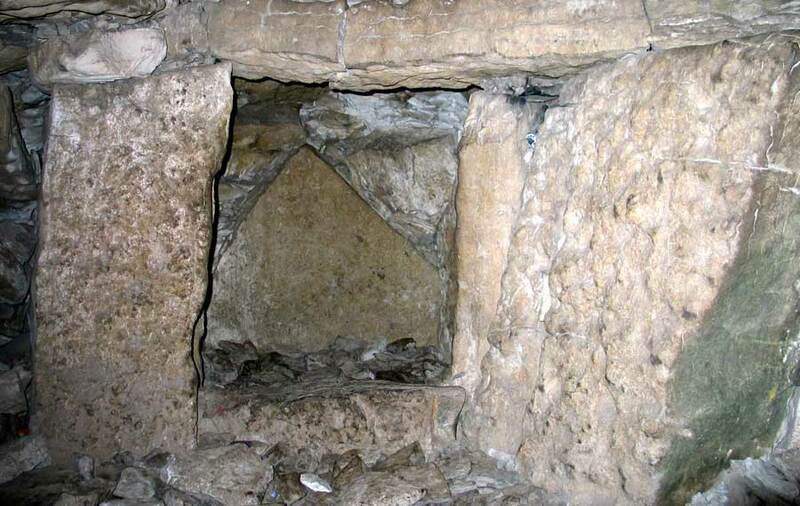 This fact helps us to account for the abundance ofmaterial used in the construction of the carns, and the large choice which was evidently available in the selection of the monoliths used for the chambers. It may be assumed that when the carns were constructed, the summit of the mountain was more or less devoid of covering, presenting an appearance similar to that of the bare limestone country of Clare and south-east Galway; and that from this old surface, heavily strewn with blocks of all sizes, now buried under the peat, the carn-builders were able to select materials suitable to their needs. The growth of peat in the vicinity of the carns has now stopped; the vegetation consists characteristically of shaggy heath, with hypnums, rather than sphagnums. In consideration of the general acceptance of the view that the "age	of	peat" is now in most places at a close, the late date of the growth of peat on these well-drained ridges is of special interest. The investigation of the was carried out during three visits in April, June, and October, 1911. On the first occasion we had the advantage of the assistance of Professor Alexander Macalister, M.D., of Cambridge, which was especially opportune in view of the large quantity of human remains that we found. His report on the human remains obtained during all three visits appears as a section of the present paper. The greater number of the carns are situated on the land of Mr. R S. S. Gardiner, j.p., and our best thanks are due to him, not only for granting permission to excavate, but for rendering valuable assistance inmany different ways. We desire also to thank the Misses Ffolliott, of Hollybrook House, and Mr. Richard Gorman, for permission to open carns situated upon their land. Mr. W. A. Green, of Belfast, very kindly came down with us on our second visit, and many of his ecellent photographs are used for illustrating this paper. Portion of the expense of the work was borne by the Royal Irish Academy, whose generous assistance we would here also gratefully acknowledge. Our thanks are also due to the Director of the National Museum for assistance in the matter of transport and other facilities. The Reek Stone or Croagh Patrick stone in the right hand or western recess of the chamber of Cairn K at Carrowkeel. The rock seems to have been deliberately shaped to mimic the tip or reek of Croagh Patrick.